Use boosting to influence the relevancy ranking of your search results. For example, if you are searching for three terms but want to place more importance and relevance on one of the terms, you can boost the term using the caret symbol ^ (Shift + 6 on your keyboard). Example: Find articles that discuss Obamacare and “individual mandates” that are part of that plan as well as the discussion surrounding medicare. 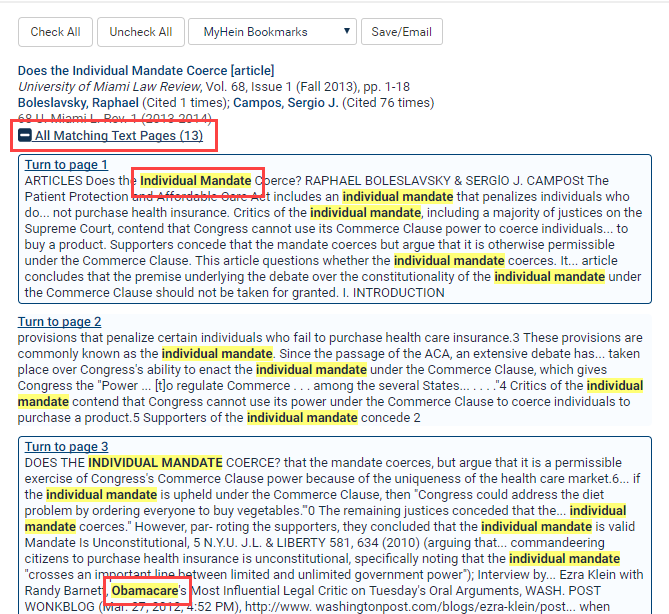 Type Obamacare AND “individual mandate*” AND medicare into the Full Text tab at the top of the Law Journal Library homepage. You will receive several hundred results. Look at All Matching Text Pages of our first few results to see our terms. Notice in the first few results that it contains all of our search terms from our search query. 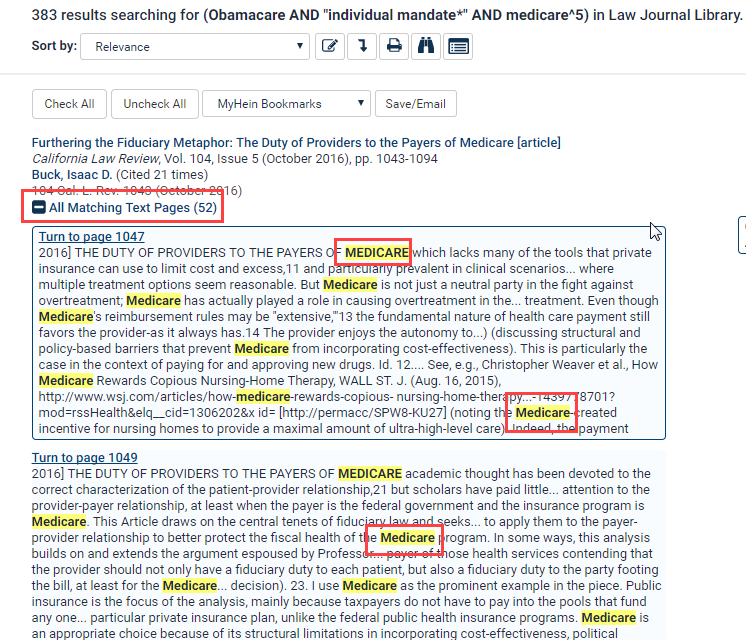 Pay particular attention to how often medicare shows up in the text of the first few results. Now, manipulate the relevancy ranking and pull to the top of our results list articles that discuss in more detail Obamacare as it pertains to medicare. To do this, boost the term medicare in our search. For this search, type Obamacare AND “individual mandate*” AND medicare^5 into the Full Text tab. Now you’ll notice that we still have several hundred results, but the results that are now at the top of our list are different. The All Matching Text Pages link will now show articles that more heavily discuss medicare than in our previous results.